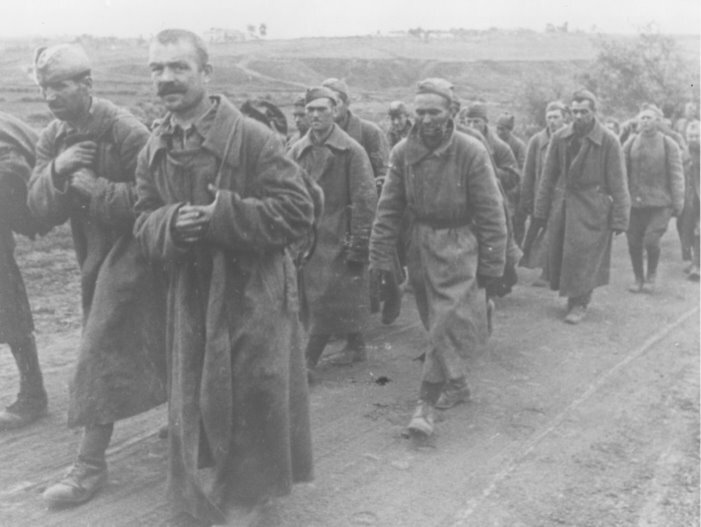 Captured Red Army men march to the rear. Most of the Soviet POWS captured in 1941 did not even make it to the camps in Poland. The German Army simply had not prepared/or cared for such massive numbers of prisoners. Here is an example of the attrition they suffered. It is hard to overemphasize how much these changing policies and the excitement generated by the New Order reoriented SS slave labor toward the end of 1941. With the foundation of Majdanek, the consolidation of the German Commercial Operations GmbH (DWB), and the recruitment of Hans Kammler, Oswald Pohl was consciously striving to integrate vertically all aspects of settlement construction from supply to the management of building sites within one institution. Himmler was fully aware that the SS would be constrained by more than just money in these endeavors. One of the scarcest resources anticipated after the war was labor, especially in the construction sector, which is highly labor-intensive. Because the Wehrmacht had captured over 3 million Soviet POWs in 1941, Himmler first hoped to feed Kammler’s Building Inspections with this ‘‘unlimited’’ supply of ready slaves as part of the spoils of the eastern campaign. The General Staff of the army agreed by September to send 350,000 into the SS’s camps. In consequence, in November, Himmler ordered the expansion of POW camps at Auschwitz and Lublin to hold 150,000 each. By the end of the year, however, most of the expected Soviet prisoners perished due to mistreatment, starvation, and exposure before they had even arrived. Of course Himmler was then ‘forced’ to deliver! Now that Russian POWs cannot be expected, in the coming days I will send a large number of Jews and Jewesses into the camps that are to emigrate from Germany. In the next four weeks you must make appropriate arrangements in the concentration camps for 100,000 Jews and up to 50,000 Jewesses. In the next few weeks the concentration camps will be assigned great industrial tasks. SS Major General Pohl will inform you of the details. These Jews (to come predominantly from Germany) were caught in ongoing plans to secure a captive labor pool to build the New Order. The 150,000 ‘‘Jews and Jewesses’’ represented only a small portion of those rounded up at this time. There were already between 200,000 and 250,000 Jews in the district of Lublin alone (an estimate that is probably low). Himmler was not, therefore, planning to halt the genocide of the vast majority of Jews in the name of an expanded labor action. The major departure in policy lay in what kind of prisoners Himmler now intended to deploy to fulfill the [Reichs Kommissar for the Reinforcement of Germandom] RKF’s dreams. While the decision to proceed with the ‘‘Final Solution to the Jewish Question’’ had been made over the past autumn, now Himmler ordered the preservation of some German Jews for the SS Labor Action because he could get no others. One thing is clear. The SS never intended to spare as many Jews for work details as it intended to kill outright, an intent reiterated in the protocol of the Wannsee Conference hosted by top officials of the Reich Security Main Office early in 1942. Berlin, 22 January 2009. The online archive on the theme of forced labor under National Socialism in Germany was presented to the public for the first time on Thursday. The internet portal “Forced Labor 1939-1945” commemorates the more than 12 million people who were forced to work for Nazi Germany. 590 eyewitnesses from 26 countries tell their life stories in 398 audio interviews and 192 video interviews. “Many survivors from Central and Eastern Europe talk for the first time about their suffering and the difficult times many of them faced after 1945. By supporting the online archive, the Foundation “Remembrance, Responsibility and Future” is working to keep alive the memory of these victims of National Socialism and at the same time making their life stories accessible to young people and academics for the purpose of political education and research,” explained Günther Saathoff, Member of the Board of Directors of the Foundation at a press conference held in Berlin on Thursday. Visitors to the website can call up the statements and recollections of Jewish and non-Jewish concentration camp inmates, Sinti and Roma, forced laborers who worked in the mines, industry or agriculture, as well as those of Italian military internees and Soviet prisoners of war. The online service is currently open to students, researchers and teachers. More detailed educational materials, such as short film biographies, classroom materials and a DVD will be available and publicly presented in autumn to mark the 70th anniversary of the beginning of the war. In 2007, the German Historical Museum also joined the project as partner. A multimedia work station containing 12 interviews has been installed at the museum and was opened for public use on Thursday. The reports and documents are now part of the museum’s permanent exhibition. The interview partners were selected to represent the major victim groups among the forced laborers: a Ukrainian Ostarbeiterin (female worker from the East), a Polish forced laborer, a Soviet prisoner of war, slave laborers from concentration camps and an Italian military internee report on the various kinds of work they had to do in industry, agriculture, mining and private households. The interviews can be selected under various categories, for example “Origins and family”, “Work and terror”, “Return and emigration”. Users can access additional information in the form of introductory texts as well as facts and figures on forced labor. The video interviews have German subtitles. “With the reopening of the permanent exhibition in June 2006, befitting space was found in the museum for its displays on foreign workers and forced laborers under the National Socialist dictatorship. And we can add an extra dimension to this theme through the inclusion of the interview excerpts from former forced laborers on the newly installed work station. The particular value of this form of display is that it gives us a direct link to the culture of remembrance and to historical accounts as related by those affected,” says Dr Dieter Vorsteher, Deputy President and head curator at the German Historical Museum in Berlin. Various speakers talked about particular aspects of the online portal at the press conference held at the German Historical Museum on 22 January 2009, including Günter Saathoff (Member of the Board of Directors of the Foundation “Remembrance, Responsibility and Future”) Ursula Lehmkuhl (First Vice President of the Freie Universität Berlin), Dieter Vorsteher (Deputy President and head curator at the German Historical Museum in Berlin), Gertrud Pickhan (Project Manager, Chair of Eastern and Central European History at the Institute for East-European Studies of the Freie Universität Berlin) and Felix Kolmer (eyewitness, Vice President of the International Auschwitz Committee, member of the advisory committee of the project “Forced Labor 1939–1945”). Eyewitness Helena Bohle-Szacki was also present to answer questions. Ms Bohle-Szacki was born in 1928 into a German-Polish-Jewish family in eastern Poland. In 1944, she was a forced laborer at the Ravensbruck concentration camp. She survived the death march in 1945. After the war, she studied art in Poland (Łodz) and has lived in Berlin since 1969. Group Captain Charles Eaton, OBE, AFC, MID, Knight Commander in the Order of Orange Nassau with Swords, received numerous honours during his lifetime, as his full title illustrates. He is remembered in the Northern Territory in a number of ways as well. There is a Lake Eaton in Central Australia and an Eaton Place in the Darwin suburb of Karama. Charles Eaton Drive leads into the Darwin International Airport, where Eaton’s portrait can be seen hanging in the arrivals hall. Moreover, the location of the airport is soon to be named Eaton also. There is a display dedicated to Eaton in the Northern Territory Parliament, and a National Trust memorial celebrating him at the Tennant Creek Airport, in which town a block of flats was named in his honour as well. But perhaps his favourite memorial would be the Charles ‘Moth’ Eaton Saloon Bar in the Tennant Creek Goldfields Hotel. But who was Charles Eaton and what did he do to be memorialised in such ways? 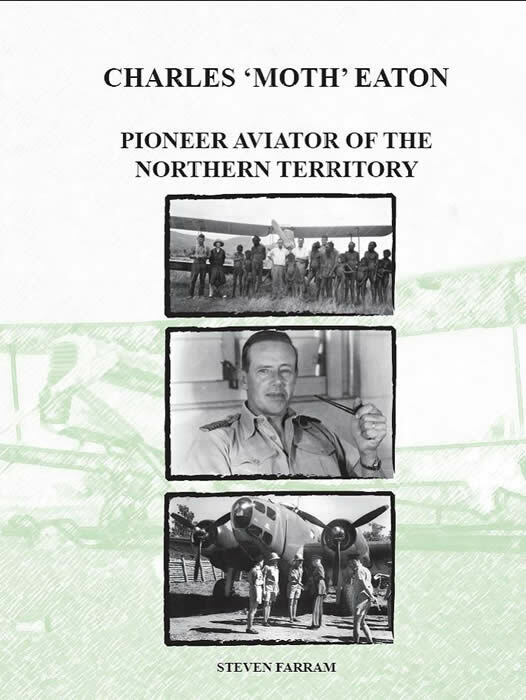 Illustrated with many rare photographs, this book outlines the contributions made to Northern Territory aviation by one of its early prominent figures, Charles ‘Moth’ Eaton. Steven Farram received his doctorate in history from Charles Darwin University in 2004. He has had a number of articles published about the history and politics of Indonesia, East Timor and the Northern Territory. He works at Charles Darwin University as a research associate.